Monkey Shines: An Experiment in Fear proves the null hypothesis that a lengthy run time can tarnish a finished product. That’s especially true in comedy, a shining example (if you will), being the otherwise great The 40-Year-Old Virgin, which could’ve used a considerable trim (albeit not from the monkey in this poster). It’s the same for horror. 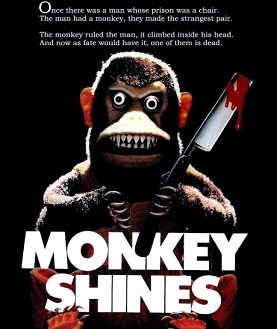 That being said, despite a nearly two-hour length, there’s loads to love about George Romero’s Monkey Shines. Jogger and uber-athlete Allan Mann is smacked by a car and becomes a quadriplegic. His geeky researcher buddy Geoff, (whose brains are seemingly bulging out of actor Jeff Pankow’s bulbous forehead) gives up one of his lab monkeys to a trainer, Melanie, who gets the Capuchin to help out with day-to-day tasks for Allan, now confined to a wheelchair. The two bond, much to the chagrin of his personal support worker, Maryanne, whose pet bird attracts the predatory eye of the monkey, now christened “Ella” after a life as “Number 6” in the university research lab. It was in that lab, you see, that monkeys were subjected to interesting, morally questionable experiments: the critters were implanted with human brain tissues. When it comes to genre films, thank god for science experiments gone wrong and lack of ethical oversight! Ella is preternaturally bright. She can answer doors, dial phones, select books off a shelf and even occasionally refill an empty treat box of conditioned rewards if required. Ella soon develops a weirdly sinister telepathic connection to Allan and is subject to his tantrums and mood swings, eventually finding her inner ape for a wild finale. Pensive and well-acted, Monkey Shines isn’t your typical lunk-headed ape-run-amok movie like In The Shadow of Kilimanjaro or the inane Link. The performances are top-notch, especially Jason Beghe (Californication/Chicago Med), who brings much pathos and gravitas to Allan (as much as sidekick Boo does as Ella). 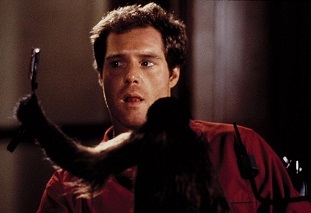 There’s a showbiz adage, “never work with children or animals,” but Beghe manages to bond emotionally both with the monkey and with love interest Melanie (the equally formidable Kate McNeil). Mired by soap opera exposition, goofy drug addiction/spurned lover subplots and movie-of-the-week orchestral swells, there’s still some genuine intrigue and low-key scares (and a few big-time frights) to be had here. While not reaching the heights of the genre-exploding Martin, the initially maligned Monkey Shines is extraordinarily original and has proven to have vampiric staying power. This entry was posted in Horror and tagged 80s horror movies, body horror, horror podcast, natural horror by Really Awful Movies. Bookmark the permalink.